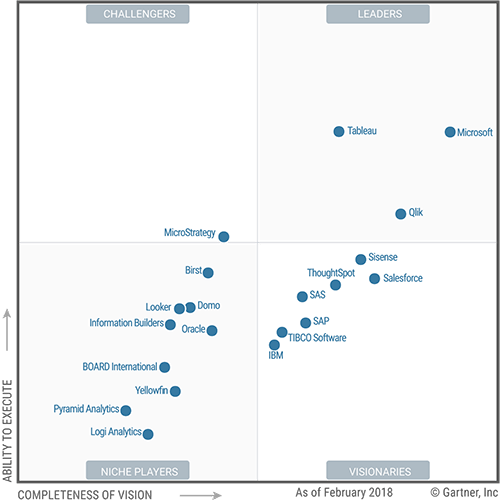 Update: Read the latest Gartner Magic Quadrant here. Every day we're innovating on behalf of our 70,000+ customer accounts, including the 16,100 new organizations that we welcomed in 2017. We're helping more people in more organizations see and understand their data, whether it's a single user on a laptop analyzing data from a simple spreadsheet, or tens of thousands of users across an enterprise executing complex queries against large, complex data sets. We are accelerating the pace of informed, intelligent decision-making by putting powerful, self-service analytical technology directly into the hands of decision makers. We believe that this helps create better workplaces, with happier employees who are empowered to fully express their ingenuity and creativity. We wouldn't be where we are today without the input and incredible support from our customers. This inspires us to expand the depth and breadth of our platform to help people do more with data. For 15 years, we've been on a mission to help people see and understand data. As data volumes continue to grow and more people need data to make better decisions, this mission has never been more important. When we introduced VizQL, we revolutionized the way people interact with data by allowing simple drag-and-drop operations to create sophisticated analyses. We also democratized data analysis, providing people of all skill sets access to powerful analytical capabilities. 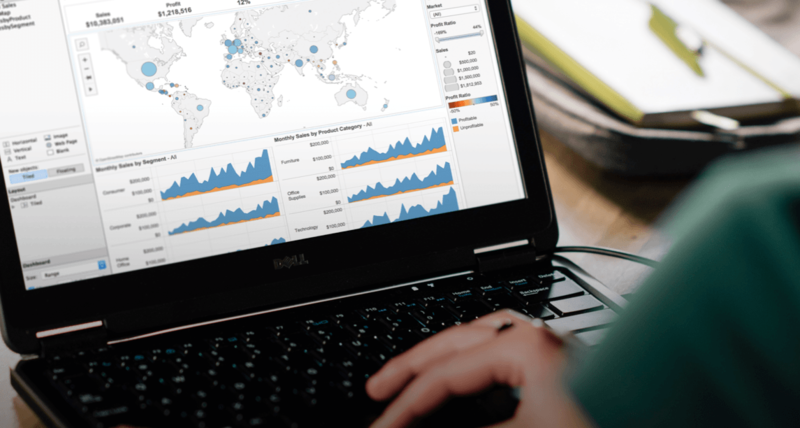 Today, Tableau continues to transform the way organizations approach business intelligence. In the past 12 months, we delivered over 100 new capabilities, with four new releases that make it easier to deploy self-service analytics at scale. We've expanded the number of data sources and size of data that you can analyze; we made it easier to answer more sophisticated questions; and we added robust governance, security, and scalability features for enterprises. To help you answer questions at the speed of thought, we introduced Hyper, Tableau's faster new data engine technology, allowing you to perform sophisticated analysis on billions of records without compromising performance. Tableau is a complete, easy-to-use analytics solution and we have added even more capabilities for people to analyze data in new ways, including native support for spatial data, support for data stored in PDF files, native integration with Python, and the ability to view details in a few clicks with viz in tooltips. And we are helping people stay on top of their data with support for data-driven alerting, rich discussions, and user-defined subscriptions. The foundation of modern business intelligence starts with strong governance, so in our 10.4 release, we introduced certified data sources for Tableau Server. IT and data stewards can define governed data sources, while business users can feel confident that they're basing their analysis on trustworthy data. We added a machine learning-based recommendations engine to suggest data sources, tables and joins based on your company's usage metrics, making it easier to find the right data to get you to your analysis faster. We launched an enterprise-grade version of Tableau Server on Linux, which for many organizations means lower costs, more flexibility, and greater security. You can also deploy Tableau Server on-premises in VM or physical environments; on public cloud platforms like Amazon Web Services, Microsoft Azure, and Google Cloud; or on Tableau Online, our fully-managed SaaS platform. And with Tableau Bridge for Tableau Online, you can now maintain a live connection for on-premises data behind a corporate firewall-enabling a true hybrid data environment. Our democratization of data is far from over. We're accelerating our pipeline of innovations, continuing to commit the highest percentage to research and development in the industry, and rapidly responding to customer suggestions. Our approach to innovation is rooted in driving tangible value to customers. We believe that every person should be able to explore their data beyond basic consumption—to analyze it on a deeper level and answer new questions. We know that oftentimes, analytics can be intimidating and complex. That's why we're finding new ways to lower the barrier to analytics. One way that we're doing this is by weaving artificial intelligence and machine learning into the core of our products, making our software smarter and helping users be more successful. We are investing in this space in a number of areas: Recommendations, smart data preparation, automatic model generation, and automated discovery. We're integrating Natural Language Processing into our products to make it even easier for everyone to interact with their data, increasing understanding and accessibility through simple, conversational-style input. The technology also learns over time and recommends common questions from other users to expedite discovery. We're also rethinking data preparation with Project Maestro, a new, easy-to-use, visual and direct approach to combining and cleaning your data. Research shows that people spend 80% of their time preparing data and only 20% of their time analyzing it. We want to flip that ratio by allowing everyone—from IT to business users—to make data prep a breeze so you can spend more time analyzing your data. Tableau is the gold standard for intuitive interactive visual analytics. With an overall rating of 4.3 out of 5 in the BI and Analytics Platforms market as of 16 February 2018 based on 1,000+ ratings, Tableau is the most reviewed and highest rated analytical platform on Gartner Peer Insights. Every user, regardless of their skill set, can ask questions of their data and share insights. We've seen this inspire large, internal initiatives that bring siloed functions together to drive impact on an enterprise scale. Nissan North America, for example, increased adoption with their data management and analytics expos to encourage knowledge sharing and transparency between IT and the business. These stories remind us that getting value out of a BI platform starts with adoption—and adoption only happens when users feel empowered. Tableau drives self-service analytics at scale so that more people can engage with data. We believe that this is reflected in this year's Magic Quadrant. We understand that every organization has its own needs and requirements. That is why we support every data strategy: on-premises, on the public cloud, in our fully-managed cloud platform, on Windows or on Linux. 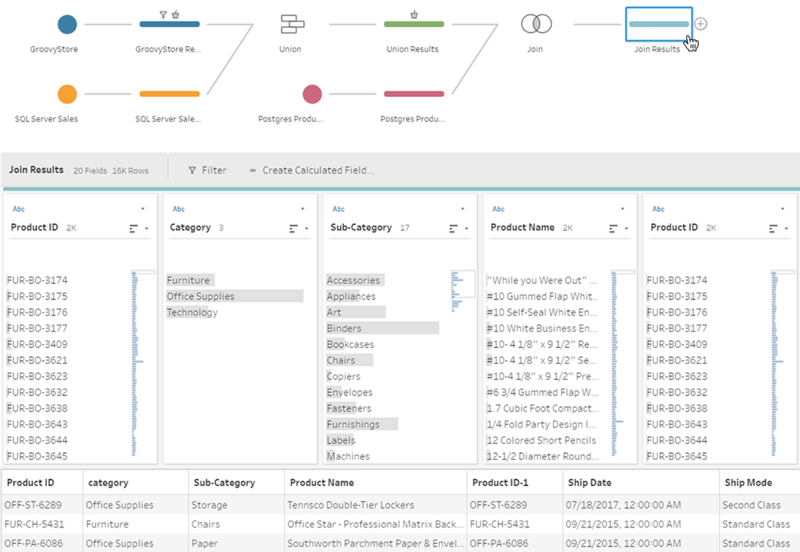 Tableau has 67 native data connectors so you can access data from virtually any source-and in the last year, we've added connectors for PDF files, Box, Denodo, Marketo, and ServiceNow. Tableau supports hybrid data connectivity which means that you can query data live without first requiring data movement or you can move some or all of the data within our fast in-memory engine. This approach is supported across all deployment environments. With Tableau, there are no hidden infrastructure costs. When deploying a business intelligence platform, the International Institute of IT Economics cited that largest total cost of ownership (TCO) costs for BI solutions come from the time it takes for people to accomplish tasks. Tableau is accessible to every level of user and it works with your infrastructure, leading to higher adoption rates, faster time to insights, and lower training costs. Overall, customers report a lower total cost of ownership (TCO) than other BI vendors. 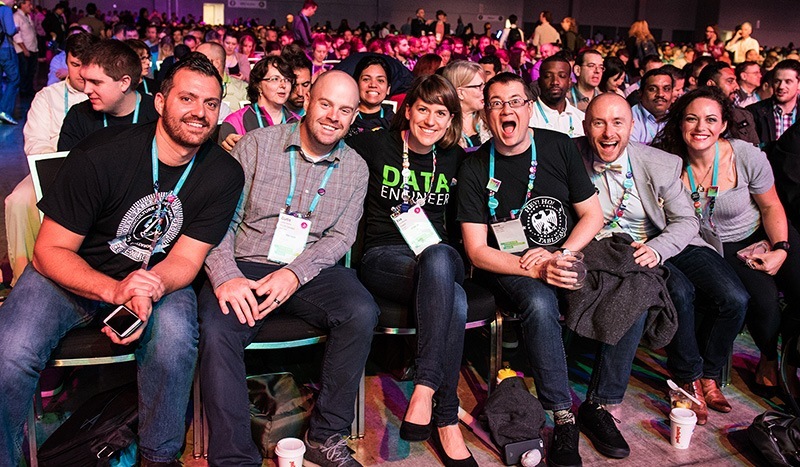 The Tableau Community is truly unmatched in passion and analytical prowess, comprised of people from nearly every country and every industry. The Community actively shapes our roadmap and inspires us. They share knowledge in 245 user groups across the globe. They contribute to Tableau Public, posting over 7,000 new vizzes every week. They offer ideas and answer questions on our forums. And as demand for data skills grow, students learn Tableau in classrooms through the Tableau Academic program. It's no coincidence that reference customers place Tableau in the top quartile for ethics and culture, with 94% of reference customers scoring it as "excellent." There's much more innovation on the horizon as we continue to accelerate our development pace. We're honored to be at the forefront of the ongoing shift towards modern BI, enabling self-service at scale and empowering more people to answer questions with data. We invite you to come along on this journey. You are at the core of everything we do here at Tableau. Your needs dictate our work. We listen to your feedback, and with each new release, we build features based on our conversations with you. We encourage you to try Tableau to see for yourself. And if you're already a part of the community, please join our pre-release program to test-drive these features when they become available and let us know how they solve your problems. You can also contribute new ideas and join the conversation on our Ideas Forum.